Fantom Drives Upgrade Kit includes a Seagate Firecuda SSHD (SSD+Hard Drive) with 128 MB cache. Firecuda is the fastest hard drive specially made for gaming. Fantom Drives Upgrade Kit delivers a market leading mix of high performance and high capacity. Upgrading your PlayStation 4 couldn't be easier! We provide all the essentials you need to backup files, install new components, and reuse the original hard drive. (Convert your PlayStation 4's original drive into a new portable drive with our included Fantom Drives G-Force portable USB 3.0 aluminum enclosure). Our quick start installation guide provides everything from preparing, removing, installing, and updating your PlayStation 4 to the NEXT level of gaming. By upgrading to a 2TB SSHD, it enables users to download more games, store more data, and increase performance. This Product also works with PS4 PRO, PS4 Slim, and PlayStation 3! 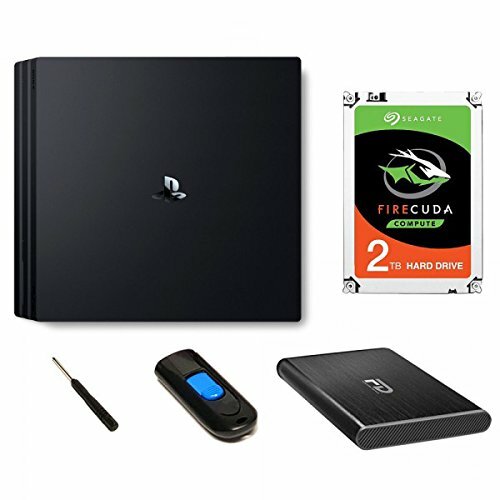 Package content: 2TB Seagate Firecuda SSHD, 16 GB Flash drive, Fantom Drives G-Force portable USB 3.0 aluminum external enclosure, carrying pouch, Philips screwdriver, micro USB 3.0 cable, quick start installation guide.